She was on her way out on a trek when I, and she, heard the distant signature call of her mate. She stopped and looked back into the distance from where the call came from for some time, but she did not answer him and she did not go in his direction. When the calling stopped, she proceeded on her merry way, out of the park, through the neighborhood, and on to her destination, wherever that was. I opted not to follow her, but rather to return to the area where the male had called from. He had called from within some dense bushes, but I thought he might appear out in the open, and indeed he did. I found him heading towards a high lookout point. He was looking for her, even though he must have known that by this time she was long out of sight and out of hearing range. He settled down in the sun to watch and wait for her. He waited and waited. After a time, he became focused on a dog playing and wandering erratically in the distance. Watching the dog was a good distraction — coyotes do get distracted by what is occurring around them which often causes them to change what they are doing. The dog was claiming way too much liberty in the coyote’s eyes: the dog dug furiously and explored off the beaten path — all within the coyote’s favorite hang-out area, and then, ultimate of insults, he marked the area by peeing on a bush. The coyote sat up and moved closer during this activity, but he did not descend the hill to “say” or “message” his disapproving feelings. He just put up with it. After all, the owner was right there. The erratically-behaving dog, though bothersome to the coyote, seemed to be minding its own business — it wasn’t searching to flush out coyotes, and it kept within a short distance of its owner. As he put up with it, another new dog, sticking to the side of its owner and therefore less intrusive, entered the scene. The coyote decided to follow them for a short distance — “where were they going and what were they doing?” This now became a distraction from the distraction. Following from behind offered the coyote a degree of protection since neither owner nor dog were likely to look in back of themselves. But the duo kept moving on and away and were not presenting any issues of interest to the coyote, so the coyote then veered off the path and then headed into the bushes for the day. By the time the coyote went into the bushes, he had either forgotten about keeping tabs on his mate, or he had decided he no longer wanted to wait for her. She would return within the next couple of hours and he knew this. As for her, the female of the pair and mother of his pups, why hadn’t she answered his call or run to join him? She acted as though she didn’t want him to keep tabs on her. I wondered if she had just gone off to hunt, or if she actually needed to get away from her mate and pups, or if she had gone off searching for her best friend. Her mate had had to fight off this other male who was the preferred suitor. Her mate had won the battle, but had he won the war — or her heart? It’s generally true in this pair that the female is rather independent in her actions, though she spends a lot of time grooming and snuggling up to her mate. The male, on the other hand, shadows her when he can and he often searches for her when she’s gone off on her own. Is he afraid her preferred suitor might reclaim her? I’m simply speculating about the motivations of the male and female based on the behavior I’m seeing. 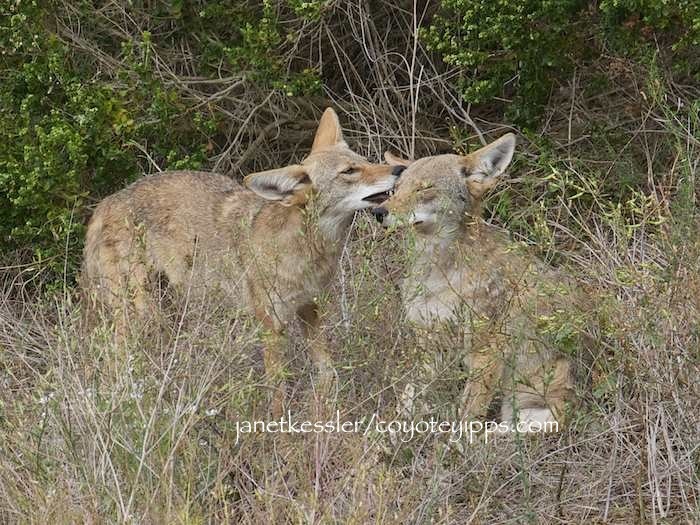 Most coyotes mate for life, but this pair began as a triangle and I wonder if it wasn’t fully resolved? We have so many new homes going up within a mile or less of our canyon. Lots of open space being gobbled up and we are hearing more yips in the canyon below our deck. 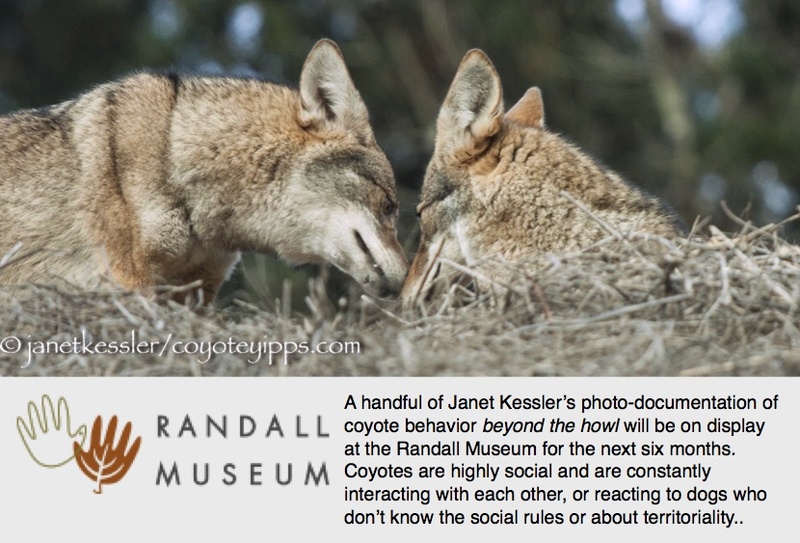 I posted some of your info on our community website to inform people who wish the coyotes were not here. Some have thanked me for this new knowledge and I encourage people to try and coexist. This drought is hitting our area hard and I am not sure the yips are getting enough wage, never mind food. Thank you again.